Need some inspiration for treating your Valentine? These Valentine’s Day Recipes are elegant! The Valentine’s Day Recipes here are easy too! If your honey loves seafood, this Seafood Fra Diavolo comes together in about 30 minutes and tastes like you spent hours! You don’t have slave over hot stove to make some impressive, delicious treats for your loved ones on Valentine’s Day! These Oysters Rockefeller are rich and decadent, without taking you hours to prepare! Valentine’s Day, is technically, St. Valentine’s Day, a fact that Americans tend to forget. Who was St. Valentine and why is he associated with this love holiday? According to this article, there are three priests named Valentinus, Valentine, who were made saints. One story is that, in Rome, in the 3rd century, Valentinus defied an order by Claudius II, baning young men from marrying. Claudius banned these marriages, because unmarried men made better fighters. Valentinus continued to wed young couples in secret, when he was discovered, Claudius ordered his death! There is no true definition of tradional Valentine’s Day Foods. Valentine’s Day is not one of those food holidays that a specific dish rules, such as Thanksgiving. On Thanksgiving the majority of Americans enjoy turkey, in some form , or other! On the Fourth of July, hot dogs and hamburgers rule and grilling! Here is a fun article regarding some vintage Valentine’s Day Foods! This Brie with Balsamic Strawberries takes less than 20 minutes, and can be made in the oven, just as easily, as making it on the grill! Fun appetizers to make for your special someone for Valentine’s Day. Here are several delicious seafood recipes to cook for that special someone! Valentine’s Day screams seafood to me! You? Make your special someone a fancy dinner for Valentine’s Day! And to satisfy that sweet tooth, how about some yummy chocolate recipes that are far superior to boxed chocolate! Of course, you need a special dessert for your family for Valentine’s Day! For other interesting Valentine’s Day ideas, See my Valentine’s Day Board on Pinterest! You need a arsenal of quick, easy recipes for Valentine’s Day! I hope you enjoy this list! This is such a fun list of recipes! They all look so delicious! Can’t wait to try a bunch of them! Thanks so much Claudia! I really appreciate that! I love all of these recipes! The hard part is going to be deciding which one to try first! Thanks so much Tayler! I appreciate your comment! Have a wonderful holiday! Wow perfect Valentine’s day dishes. Chocolate truffles, the oysters and those scallops with strawberry for me! That last one had me drooling. We love scallops! We are huge fans of scallops too! All good choices though! Thanks Jaxqueline! Those balsamic strawberries with brie got me. I need that in my life. A perfect choice for Valentine’s Day. It is so delicious! Thank you so much Amy! These recipes look so perfect for Valentine’s Day! I especially love the Chocolate Fudge and Pasta! Yum! Thank you Shanika! We are huge fans of the fudge! What a delicious selection of Valentines Day recipes! So tempted to try them all! There are some pretty good ones in here! Thanks Bintu! A great selection of recipes here and I’m intrigued by the oysters so definitely doing those and the brie too! Oh, the oysters are delicious, Amanda! I’m sure you will enjoy them! Lovely collection of dishes for Valentines day!! All dishes looks irresistible, tempted to try brie and fudge. The brie and the fudge seem to be everyone’s favorite! Thank you Geetha! 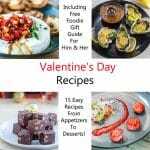 What a great selection of Valentine’s day recipes you got here, I need to try them all also for our Sunday meals. The one I’m going to make first for sure is the Oyster Rockefeller, mouthwatering!!! The oysters Rockefeller is one of our favorite! Thank you Patty! What a wonderful collection of recipes, that stuffed trout recipe looks and sounds heavenly! I absolutely love the trout! It is so flavorful! Thank you Brian!